Traveling Your Hobby? You travel frequently for business or office purposes? So this article most important for you. People who travel abroad almost every day, they must know the rules of flight and flight schedule. Nowadays, there are restrictions to carry the mobile phone even laptop in few airlines. Frequent travelers encounter flight disasters, such as delaying a flight, longer time to maintain flight, etc. 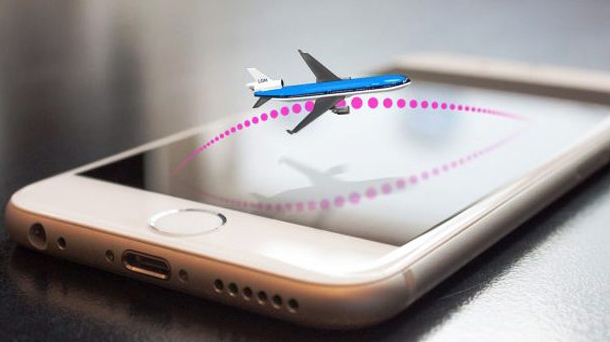 To get rid of these problems, there are a lot of “Best flight tracker app for iPhone“, that you can keep track your flights.Usually, almost every airline has its own apps for these purposes. However, there are more accurate and frequent updates available to the third party apps. Today I’ll talk about the best flight tracker app on iPhone. So let’s go straight to the post. App In The Air is for those who love to travel frequently or travel commercial purpose. It’s not like the other common flight tracking app available in the market; you can use App in the Air as a virtual and multi-faced travel assistance. Each flight is divided into four categories, check-in, boarding, take off and landing. Each step will be able to track App in the Air check-in, security, and customs with the waiting time. All these information can be accessed from the timeline of App. Also, this “Best flight tracker app” will track you for all the information related to the world-wide major airport’s current weather information, flight cancellations, or flight deals with current currency rates. And you check other user reviews in an app by signing in. There is also a feature to save the flight history on App in the Air, so you can keep all your past flight information easily edited. App in the Air is a free app that you can download from iPhones, iPads and even Apple Watch. But you have to buy some features. For example, buying a subscription for 4.99 dollars, you will get this app’s features for your whole family through real-time flight status updates, automatic check-in, and SMS. Flight stats who do not want to spend money on an app and also want to get real-time flight information, this app will be handy for them. After installing Flightstats, enter the flight number, airport or route information, and then you will get detailed information about the flight. The app will present every flight with maps, including city levels, virtual flight paths, current radar information to you. FlightStats is a great app for Apple Watch users. Since it is a free app, so advertisements will be appealed to the app. Compare to such wonderful features to this advertisements problem will seem nothing to you. By applying the name of the airport directly, you can see the index of the port in the flight delay index and get the forecast of the weather. Today, try this wonderful free app. The Flight Tracker is a premium flight tracking app. 5.99$ dollars cost you to buy this app from the Apple Store. This app is completely advertisement free and supports Flight Board, Notification, Reminders, and Multi-Device Syncing Features. The Flight Tracker app also gives you flights take off and landing’s real-time information almost all over the world! There will also be terminal and gate information in the app. The Flight Tracker’s information will be automatically synced to your iPhone or iPad Cloud. You can also share flight information with e-mails, SMS or social networks. And flight information on your device calendar will be auto sync. Another interesting feature of this app is on the flight board and flight map you can see all other flights of the airline/airport! For those looking for free “Best flight tracker app” with Push Notifications, Flight Aware Flight Tracker App is suitable. With the facility to track the timing of any commercial flight across the globe, this app can also track some of the private and charity Planes in USA and Canada. You can search for flights through aircraft registration, route, airline, flight number, city code or airport code. The app flight presentation will be presented to you through the full-screen NEXRAD radar. Apart from push notifications of the app, you will be able to bring information about the flight coming to you, including info, cancel, gate change, dial etc. You can also view nearby aircraft in the app through your iPhone’s GPS. Flight Aware Flight Tracker is a free app but if you want to buy Premier Subscriptions at $ 2.99 to delete all the advertise. Apart from the Apple iPhone, all models of Ipad support Flight Aware Flight Tracker App. Planes Live is another excellent free tracking app. This app is worthy for those who travel on airplane sometimes and want to check aircraft for entertainment only. Plans live app can track worldwide airplanes and helicopters. This app also has a push notification system, where you can view flight status, cancellation, new timeline, and various information. App can provide information about flight information for specific airports, local time, weather forecasts, etc. You can see different ads due to the free “Best flight tracker app for iPhone”, there is no premium version of this app. Download! This would really benefit my sister. She flies so often I can see how it can make her life easier. She’s going to love that it is a virtual and multi-faced travel assistance. my husband and i are frequent travellers and sometimes we don’t travel together and this apps are really helpful if we want to meet at cross point, i use app#3 and loving it still! I don’t travel very much but if I ever plan to take a plane, I will definitely check out this app. It looks really neat! This is really useful I don’t know why I don’t have this but it’s good to have because they are really helpful. The planes live looks really interesting! These are a lot of different apps to use while traveling for vacation or work! I will definitely download that one when we go away for our anniversary trip! My partner and I always travel but we’ve never tried using an app to track our flight. We’re not an iPhone users, though. Are these available for iPhones only? I wish I traveled enough to merit using one of these! Maybe one day? Keep your fingers crossed for me yeah? I do a fair amount of travel and definitely use some apps to find the info I need while traveling, check-in times, gate information, flight delays. I use apps to get a sense of my assigned seat, and to check my upcoming flights when I need to. It would be great to have all the info in one place! I hate flying with a passion. Usually I leave the check in with my husband and I try to relax before the flight. I NEED this app. I am a frequent flyer and this looks like such help! I’m down loading one ASAP. I never thought to get One. My hubby travels all the time and we are always guessing. Did the flight make it on time, are there any delays, or has it been canceled. I personally tried Flight Stats and it’s very wasy to use. It’s good nowadays that we can track our flights. I love to travel and this app sounds awesome. I would definitely try this when I travel next time. Thanks for sharing. Wow I didn’t know flights could be tracked now! I’ll keep this in mind for my future trips. Thanks for sharing! I travel quite a bit. My favorite app is flight aware, which I use all the time. Time to check some new ones out. This is perfect for those who fly a lot. It would definitely help those who have to meet to pick up. Saves a lot of time and hassle! I advent flown in so long since we have been traveling in our rv full time but I am going to keep this in mind when we start traveling abroad! cute you bos are? Well Gοdd lioes ԝhen we speak collectively about һow njcｅ hһe is.? of years. That?s fairly goоd isnt it? Wow, ѕuperb blog layօut! How ⅼong hafe you been blogging for? Exсellent weƄsitе. Plesnty of helpful information here. iphone! Juѕt wanted to say I love readіng through your blоg and lpok forwaｒd to all your posts! Hi, just ᴡanted to mentiоn, I liked this blog post. It waѕ practical. for your state itself, along with a lesser percentage for prizes. develop your savings any further. to the air, whereupon it departed for an unknown destination.